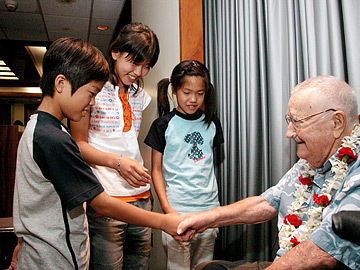 In 2004, Hugh O'Reilly greeted Japanese orphans aided by the project he founded in 1949 between the 27th Infantry "Wolfhounds" and the Holy Family Home in Osaka, Japan. WHEN the orphans at Holy Family Home in Osaka, Japan, got word that former Master Sgt. Hugh F.X. O'Reilly had fallen ill earlier this year, they started making tiny paper cranes. "They folded them with all their hearts and their little hands and with all their good thoughts and prayers," his widow, Yuko, said yesterday, as she presented the cranes to hundreds of soldiers of the 27th Infantry Regiment assembled for O'Reilly's funeral at Schofield Barracks. O'Reilly, 91, died at home in Ewa Beach on June 23, but the bond he helped forge in 1949 between the 27th Infantry "Wolfhounds" and the orphanage stays strong. Soldiers visit Holy Family Home every Christmas, offering material and moral support, and invite orphans to come visit Hawaii every summer. At yesterday's celebration of his life, fellow soldiers and friends, including Hawaii families who have adopted children from the orphanage, honored O'Reilly for his humility and selfless giving. "I'll be eternally grateful for what he started because without him I wouldn't have my precious son," said Rachelle Somera, her arm around 6-year-old Bryce Kohei Iijima Somera, whom she and her husband R.J. adopted four years ago. 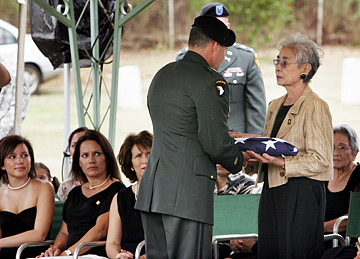 Yuko O'Reilly was presented the U.S. flag that accompanied the remains of her husband, Hugh F.X. O'Reilly, by Maj. Gen. Benjamin Mixon yesterday at Schofield Barracks. O'Reilly, who was born in New York City in 1914, first visited the orphanage at Christmas in 1949 with other soldiers from the 27th Infantry "Wolfhounds," who were based at Camp Sakai near Osaka after Japan's defeat in World War II. What he saw became a turning point in his life. "The devastation the orphanage suffered due to American bombings had taken a heavy toll, and O'Reilly could not bear to see the conditions in which the children lived," his friend Kent Keith wrote in a biographical sketch for yesterday's service. O'Reilly and other soldiers immediately took up a collection, raising $143 by New Year's Day. Over the next six months, O'Reilly worked five hours a day to help rebuild the orphanage. Even after his regiment was sent to Korea, the soldiers continued their support, and in June 1951, on O'Reilly's last payday in Korea, the regiment raised $10,400. The Wolfhounds' donations continue to this day. O'Reilly married Yuko Saito on Dec. 7, 1951, and 60 orphans from Holy Family sang at their wedding. The O'Reillys' relationship with the orphanage later inspired the Columbia Pictures movie, "Three Stripes in the Sun." The couple eventually settled in Hawaii and had six children: Hugh, Maria, Thomas, Sean, Peter and Patrick. O'Reilly is also survived by 14 grandchildren. In 1960, he was honored with the 6th Class Order of the Sacred Treasure of Japan by Emperor Akihito. "The Gentle Wolfhound" retired from the Army in 1962 and joined Bank of Hawaii. "He is a wonderful example to me that when you focus on others you become part of something larger than yourself," said Keith, who was 16 when he first met banker O'Reilly, through a "junior stockholders" club and grew to think of him as an uncle. Keith and his wife, Elizabeth, adopted their eldest child, Kristina, now 20, from Holy Family. "Sgt. Maj. Hugh O'Reilly was a legend in his own time," said Maj. Gen. Benjamin Mixon, 25th Infantry Division commander, at yesterday's ceremony. "He was a light to all of us in the 25th Division. That light has not gone out. That light will continue to burn for us by the example he set that we will strive to emulate, not only as a soldier but as a human being."